Spring came later this year than last, but now the blossom's well under way. And the wet weather has kept the frost at bay, so it hasn't been killed. 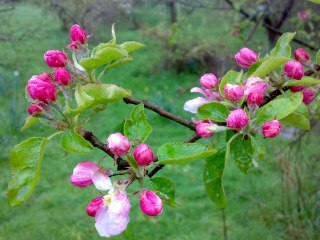 So the orchard is a riot of pink and white, and - touch wood - 2012 looks to have started well. On the ground the pheasants are nesting, so we're staying clear of the apple trees for a few weeks. Here's a picture of some of the first blossom to appear, I think it might be on one of the Bramleys. Not a cider apple at all, but it makes a good picture.